Children and adolescents with a congenital heart defect (ConHD) frequently undergo painful or frightening medical procedures and hospitalizations. They often need multiple invasive procedures at a very young age and require regular checkups during their entire life. From other pediatric populations, it is known that these kinds of experiences can result in acute stress reactions and even in post-traumatic stress disorder (PTSD) in the long-term. PTSD and also subthreshold PTSD can lead to serious (psychosocial) impairment. However, limited information is available about PTSD in children with ConHD. 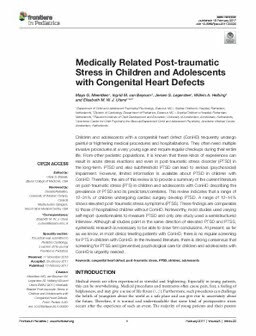 Therefore, the aim of this review is to provide a summary of the current literature on post-traumatic stress (PTS) in children and adolescents with ConHD describing the prevalence of PTSD and its predictors/correlates. This review indicates that a range of 12-31% of children undergoing cardiac surgery develop PTSD. A range of 12-14% shows elevated post-traumatic stress symptoms (PTSS). These findings are comparable to those of hospitalized children without ConHD. Noteworthy, most studies used varying self-report questionnaires to measure PTSD and only one study used a semistructured interview. Although all studies point in the same direction of elevated PTSD and PTSS, systematic research is necessary to be able to draw firm conclusions. At present, as far as we know, in most clinics treating patients with ConHD, there is no regular screening for PTS in children with ConHD. In the reviewed literature, there is strong consensus that screening for PTSS and (preventive) psychological care for children and adolescents with ConHD is urgently needed.